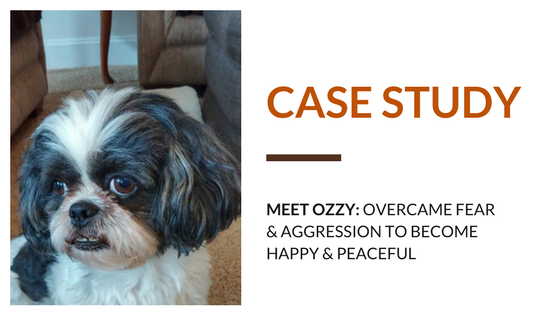 “From the first day we rescued Ozzy he had difficulties with us leaving him alone, fear of loud noises and aggression with a few dogs, which developed into aggression with most dogs when walking him on a leash. As time went by all of Ozzy’s problems gradually increased to the point we could never leave him alone, he would keep us up all night when there was a storm with wind or thunder and he would start growling and fighting with any dog in the neighborhood. We finally knew we had to find someone to help us. We were introduced to Kim Greco and “Paws and Possibilities”. At first, we were reluctant to leave Ozzy with a trainer for two weeks, but knew we had to make some changes in his life, as well as ours, so he would be a more relaxed and happy dog. We went south on vacation and Ozzy went to stay with Kim Greco. We received emails with videos every night, which put us as ease that he was getting excellent care as well as the needed training techniques to improve his behavior. When Ozzy came home, we saw immediately that he was a more relaxed and content dog. He still responds to loud noises but quickly settles down with a little coaxing technique. With a proper harness, he no longer pulls us along while walking and is much calmer when he sees another dog. We have gradually left him alone for longer periods, with a camera on, and surprisingly he has not barked once.